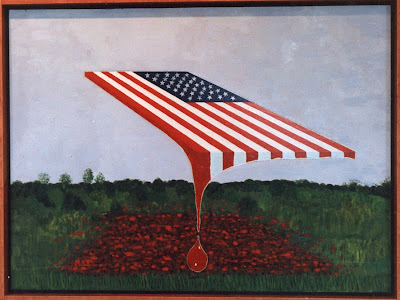 I started painting in 1987-88, and I was then working in oil paint and enamel paint on masonite. I was also working with larger pieces then, but as I continued to paint, the size of my paintings got smaller. Where in the hell do you put this stuff if no one buys it? Now I paint in acrylic as I like the ease of cleaning up and washing my brushes. Perhaps some day I might go back and do a few pieces in oil as I have a couple of pieces in mind from the time I worked on a Norwegian freighter in the summer of 1964. This week as I was cleaning up my t-shirt room (where I keep plastic containers filled with t-shirts and other items for my t-shirt business), I decided to hang these 2 early paintings downstairs and get them off the floor. So, now they hang on the first floor until some one comes along and buys them. I am not sure why I used enamel paint for the flags on these two pieces. All I can think of now is I was trying to get the flags to pop off the canvas. 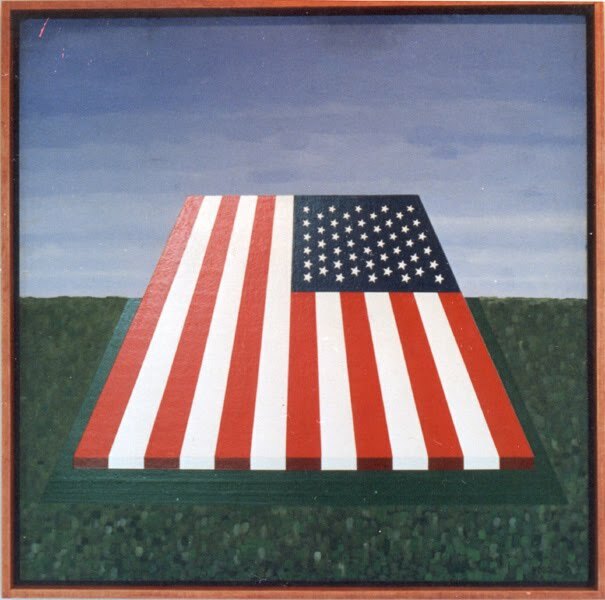 The top painting: American Flag Makes The Scene was painted in 1987-88. The bottom painting: Untitled For Now was painted in 1991.